Uncategorized – Page 3 – 1200 Dean Street Block Association Inc. 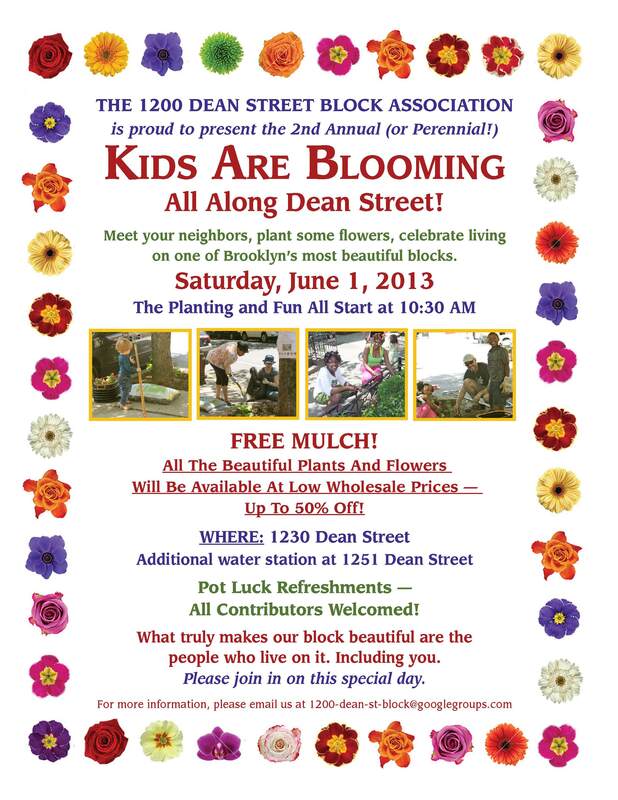 Please join us for our second annual spring planting and block beautification event “Kids Are Blooming” on Saturday June 1st. There will be free mulch for planting and we will be selling flowers for planting. Enjoy pot luck refreshments (and please feel free to bring something!). Our next Block Association Meeting will be held on Tuesday ,October 2nd @ 6:30pm. Reminder! 1200 Dean Street Block Association Meeting tonight Tuesday June 5, 2012 7pm Bedford Central Presbyterian Church. See you there! “Kids Are Blooming” a huge success! We had perfect weather, and a huge turnout for our first “Kids Are Blooming” event on Saturday. Here are some photos. Thanks to everyone who worked hard to make this happen, and to those who helped plant all those beautiful flowers! Posted on May 13, 2012 May 14, 2012 Categories UncategorizedLeave a comment on “Kids Are Blooming” a huge success! Kids Are Blooming All Along Dean Street! Meet your neighbors, plant some flowers, celebrate living on one of Brooklyn’s most beautiful blocks. We’ll supply all the plants, the soil, the tools and the water. You supply the desire to help make Dean Street an even more beautiful place to live. Hey, is that a rose on your nose? What truly makes our block beautiful are the people who live on it. Including you. Please join us on this special day. Please be advised that the next meeting of the 77th Precinct Community Council Meeting will be held on Monday, April 9, 2012 at 7:30 P. M., at the precinct house located at 127 Utica Avenue @ the corner of Bergen Street. The meeting is held every second Monday of the month at the precinct unless otherwise noticed.